Ever since Castlevania: Symphony of the Night, Castlevania has taken on an RPG-like action gameplay similar to Super Metroid. The franchise spread to handhelds and still retains the same style of gameplay. Each game never does really differ much from the previous in terms of gameplay but each installment never truly gets old. Harmony of Despair is Castlevania's first attempt into an online multiplayer with the usual Castlevania gameplay. The results are very plausible also! The developers really have captured the feel of what a multiplayer Castlevania should play like. Harmony of Despair is composed of six chapters of the usual Castlevania RPG-like action gameplay that we have known since Symphony of the Night. Many of the stages have areas that are taken directly from Symphony of the Night or the newer handheld versions of Castlevania. Two of the stages are made up of areas directly from Portrait of Ruin. It's far from just a simple cut and paste job though. The stages are like more compacted versions of the Castlevania games that they borrow from. 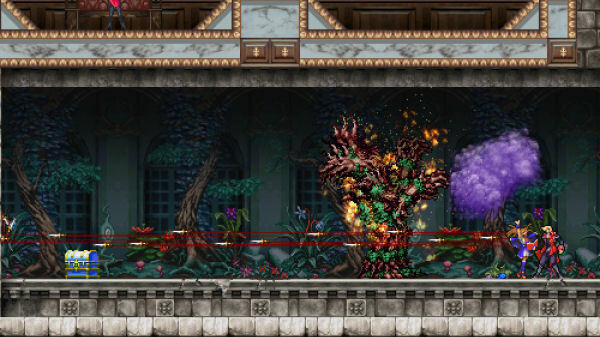 Each stage has a boss that is taken from one of the other Castlevania games. Many of the bosses in Harmony of Despair are quite unique. They are not all confined to one room. Some of the bosses can actually exit they're boss room and attack the player. The boss of stage 5 can actually travel outside of his room in spirit form and attack players while they try to progress through a stage. Some bosses require a player to zoom out on the action in order to follow the boss or actually see the full boss. A player can scroll in and out of the current view. In the usual Castlevania, a player has to constantly pull up a map to keep track of where to go, but in Harmony of Despair, the actual stage view is your map once fully zoomed out. A player can play in a full zoomed out view - basically play from a map view. There are three types of zooms that can be adjusted. For the three default views, one shows the entire stage, one shows a closer zoom that still shows off many of the rooms around the player and final is the usual view that shows the player and a good bit of the surrounding room. The graphics for Harmony of Despair resemble a Castlevania DS title. The character models are taken directly from the game that they appeared in. All the usual animations are still retained for each character as they were in the their respective game. The graphics are now presented in 1080p High Definition however and look great!